LTG (ret) Bill Harrison, first mayor of Lakewood, prepares to snip the ribbon. Meg Justus, museum consultant for our exhibits over the past several years, stands amidst her latest creation. 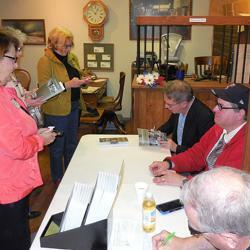 Noted local author/historian team Neary and Dunkelberger signing copies of their latest book. Visitors were greeted in the lobby by a display of photos-some of them dating back to World War I--of local veterans brought in by their friends and relatives-and by plates full of pastries generously donated by the House of Donuts (plus other delicious refreshments supplied by selfless members). Cinnamon twist and coffee in hand, a visitor could then stroll to the back of the museum, past the beautifully preserved WWI uniform of Camp Lewis doughboy Warren Manley Taylor (on loan from Society VP Glen Spieth), and have their freshly-purchased copy of "Local Legends of Lakewood" signed by co-authors Steve Dunkelberger and Walter Neary. The follow-up to their local best-seller, "Images of America: Lakewood", Steve and Walter's latest is not to be missed by anyone interested in the "whos" of history, the colorful characters that shaped the city and region we live in. Speaking of Local Legends, with the arrival of honored guest Bill Harrison, Lt. General USA (retired) and Lakewood's first mayor, the stage was set for the Grand Opening ribbon-cutting ceremony. Accomplished to general applause, it was followed with a few remarks by Society President Becky Huber (which included a heartfelt reading of a poem on the worth of our warriors--active and retired, living and dead. The poem is available here as a pdf; see link at bottom of page.) --then came the first public viewing of the informative display plaques and historical artifacts created or arranged by museum consultant Meg Justus. 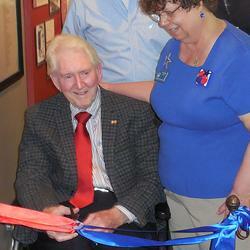 A number of local dignitaries were among the first to step over the freshly-cut ribbon to enter the main exhibit space. These included Pierce County Councilman Doug Richardson; Lakewood City Council members Marie Barth and Jason Whalen; former Lakewood City Manager Andrew Neidtz (now Executive Director of the South Sound 9-1-1 Service); and the current City Manager, John Caulfield. Special recognition is due a guest we were particularly pleased to have on hand: CPT Nicole Protz. The last company commander of the 472nd Signal Company--the unit the Lakewood Historical Society sponsored for four years, through two deployments--Nicole was with the unit during its 2012-13 deployment in Afghanistan. Her unit was inactivated in December, 2013, at a ceremony attended by many well-wishers, including our president, Becky Huber. Along with the inactivation of the 4th Brigade, 2nd Infantry Division in March, 2014, this marks the end of an era of military history at Joint Base Lewis McChord, and the museum is fortunate to have obtained a few relevant artifacts from that era. It's an honor to have them among the items in our exhibit display. The main exhibit will be on display for a year (the veterans' photos only until June 30, 2014, however), so if you didn't have a chance to attend the first day, there are plenty of opportunities remaining--just be sure not miss this tribute to a vital presence in our community! The museum is in historic Lakewood Colonial Center, 6211 Mt. Tacoma Drive SW; hours are noon to 4 pm, Weds-Sat. No admission fee, although free-will donations are gratefully accepted. Tour groups welcome! 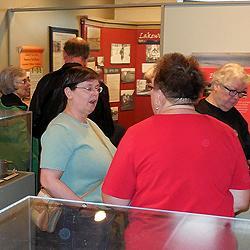 Call (253) 682-3480 or email us at contact@lakewoodhistorical.org for more information.